GlaxoSmithKline (GSK) has obtained a High Court emergency injunction against animal rights extremists who threatened the drugs group's investors. The injunction prevents the Campaign Against Huntingdon Life Sciences from sending more letters and from revealing personal details of GSK shareholders. Meanwhile, pro-research group Pro-Test has bought GSK shares as a "gesture of solidarity" with GSK and its investors. The government has also pledged to look at ways to protect investor privacy. Police are investigating the letters, which threatened to reveal the names and addresses of GSK shareholders on the internet if they did not sell their shares in the firm within a fortnight. GSK's chief executive, JP Garnier, said his shareholders - at least 50 of which were sent the letters - had shown "courage, integrity and resilience" in the face of the threats. He also described the activists as "extremists" who had behaved in "a deplorable way". Investor groups have denounced the letter campaign as "terrorism", while GSK said shareholders felt "victimised". Pro-Test said it had decided to buy the shares to show extremists that "intimidation has no place in the UK". "Animal research saves lives, it is ludicrous that people are threatened in this way," it added. Fellow medical research group, the Research Defence Society (RDS), meanwhile, defended animal testing as a "small but vital" part of medical research which has helped save millions of lives. "We do this research to save people's lives and to prevent human suffering and we have to use animals," RDS chief executive Dr Simon Festing said. However, animal rights groups, such as People for the Ethical Treatment of Animals, have defended the campaign. "If you invest in a company that is involved in animal torture, then you should expect - it's a public limited company - that information is open to the public," one campaigner, John Curtin, said. One investor who received one of the letters, former Glaxo employee James Galpin, appeared unfazed. "It's completely the wrong target if you actually want to change what kind of testing is done on drugs," Mr Galpin said. "Targeting one individual pharmaceutical company isn't going to do anything. You have to target the regulatory authorities." 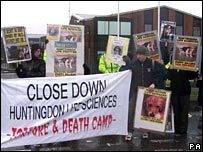 Activists have targeted animal testing firm Huntingdon Life Sciences and its business partners for years. An intimidation campaign led to Huntingdon being delisted from the London Stock Exchange, and its US parent company had its listing on the New York Stock Exchange postponed last autumn. "We deplore long-term campaigns of violence, intimidation and harassment against employees, their families and people associated with the company," a GSK statement said. GSK said it would continue to work with HLS despite the threats and urged anyone sent a threatening letter to report it to the police. It also advised investors worried about their privacy to transfer their shares to the GSK corporate nominee service or ask their stockbroker to hold them in a nominee account.